Learn why you should — and maybe why you shouldn't — draft players 1-10 in our consensus rankings. Welcome to our 2019 Player Profiles series. We are going through the top-300 in Heath Cummings and Scott White's consensus rankings to give you the case for and the case against drafting each player. By the time you're done, you'll know everything you need to know for drafting in 2019. The Case For: I mean ... It's Mike Trout. I don't really have to do this, do I? OK, fine. Trout might not be the best player in Fantasy every year -- in fact, he hasn't been since 2014 -- but there is only one player who has topped him more than once on a per-game basis over the past five seasons. Sure, Mookie Betts, Bryce Harper and Charlie Blackmon have bested him in recent years, but it usually takes a career year for someone else to match Trout's ho-hum, run-of-the-mill year. The Case Against: Well, Betts has bested him two of the past three years, and Trout has missed 22 and 48 games in the past two seasons, so there could be some concern about his durability. If you squint, you can make an argument for someone who isn't Trout, but you're probably overthinking it if you draft someone else other than Trout at No. 1 overall. You'll have tough choices to make, but this won't be one of them. The Case For: Well, I did say Betts has bested Trout in two of the past three years, which is a pretty good case. Picking No. 2 is basically like picking No. 1 this year, because Betts is really more like a 1A. At his best, Betts is a rare five-category talent, averaging a .308-117-29-98-27 line over the past three years. He rarely strikes out, so he's a good bet for a high average, and his swing is perfectly tailored for Fenway Park. If Trout didn't exist, Betts would probably be the unanimous No. 1 pick. The Case Against: Unlike Trout, who has been an unmatched source of consistency basically since Day 1 of his career, we've seen ebbs and flows from Betts. He's been the top hitter in Fantasy in 2016 and 2018, but he was 17th in 2017 despite playing 152 games. That's not bad, per se, but when comparing him to Mike Trout these slim distinctions matter. The Case For: He might not look like your prototypical power hitter, but with 68 homers over the past two seasons, skepticism just doesn't make sense anymore. Like Betts, a low strikeout rate ensures a relatively high batting average even during lean times -- his .252 BABIP in 2018 was the 12th-lowest in baseball, and he still managed to hit .270 -- and he was fifth in stolen bases. With a little better luck from the BABIP gods, there may be no discernable difference between Ramirez and Betts in 2019. The Case Against: Ramirez has gotten dramatically better each season, which also means he's only ever played at this level for one season. He wasn't bad in 2017, of course, but 2018 was his first season as a truly elite, top-five player. His 34 steals played a big part in his leap, as did his 39 homers, and both were relatively huge outliers for Ramirez's major-league career. Neither looks unsustainable necessarily -- he was in the 74th percentile in barrel rate, the 94th percentile in average launch angle and 52nd percentile in average sprint speed -- but any dip could knock him down to the second tier of hitters. The Case For: You can set your watch to Nolan Arenado's production. He's been between 37 and 42 homers, 110 and 133 RBI, 97 and 116 runs and a .287 to .309 batting average over the past four years. Coors Field helps, of course, but guess what? Arenado's still going to be in Colorado's thin air in 2019. As long as that remains the case, Arenado is a near-lock to be among the league leaders in power and run production with a .300 average to go with it. The Case Against: Well, at one point it seemed like Arenado might not be long for Colorado if the season took a turn, but the extension he signed this spring takes that off the table. So ... he doesn't steal bases, I guess. That probably puts him out of the conversation for potential No. 1 overall play. But the floor is exceptionally high, still. The Case For: A top-five Fantasy hitter in three out of the past four years, Altuve took a step back in 2018. By that I mean he was still a top 60 overall player despite missing 25 games. That's not a bad floor, and the ceiling is still sky-high. Before a knee injury in late-July, Altuve was hitting .329 and on pace for 15 HR, 22 steals, and 172 combined runs and RBI. Not quite his usual standards, but better than his full-season numbers. As long as he's healthy, Altuve is the best bet to win a batting title in the sport and is one of the rare power-speed threats around. The ballpark and lineup don't hurt. In 2014, he was a minimal contributor in HR, R and RBI, but stole 56 bases and hit .341. In 2016 and 2017, Altuve was a true five-category contributor, hitting nearly .340 while going 30-30 and around 200 combined R and RBI each season. We know he almost certainly won't steal 50-plus bases again, and his per-162 paces before the injury were not those of a top-five hitter either. He might justify his draft cost here with that production, but he needs to get back to 30 HR and elite run and RBI production to turn much profit. That may not be there anymore. The Case For: You're paying for stability as much as you're paying for production here, and the production is just about as good as anyone in baseball. Scherzer has a 2.52 ERA and 0.907 WHIP over the past two years, and he topped the 300-strikeout mark for the first time in his career in 2018. He also has 200 innings for six straight years with four seasons over 220, and no other pitcher even reached 220 innings last season. The Case Against: He's a pitcher, and a 34-year-old one at that. He hasn't broken down yet, but the innings are piling up. It happens to every pitcher at some point, and last season 138 starting pitchers hit the DL, according to spotrac.com. Pitchers are healthy and dependable right until they aren't — just ask anyone who drafted Madison Bumgarner in the past two years. The Case For: What can you say? Martinez is arguably the best hitter in baseball, and he plays in a park and lineup that ensures he'll rack up huge counting stats. He proved 2017 was no fluke with a .330 average, 43 homers, 130 RBI and 111 runs, and you'll be hard pressed to find a better contributor across those four categories. He might be a better option than Arenado from that standpoint. The Case Against: He probably isn't going to hit .330 again because a .375 BABIP is high even for Martinez. OK, so he might only hit .310. The bigger concern is the lack of steals (just six in 2018, a career-high) and his injury history; prior to playing 150 games last season, he hadn't topped 120 since 2015. The Case For: We probably haven't seen the best of Francisco Lindor, which is scary, because what we've seen so far has been pretty dang good. He's been the No. 5 hitter on average over the past three seasons, despite some bad BABIP luck over the past two years. He's hit .273 and .277 with a .275 and .279 BABIP, but xBABIP suggests he should be more in the .300 range. Like his teammate Ramirez, Lindor's power surge has been pretty much out of nowhere, but the batted-ball data suggests it isn't a fluke. The Case Against: It was tough to make the case against Lindor until he suffered a calf injury a few weeks before the start of Spring Training. Now? It's pretty easy. The best case-scenario sees Lindor returning to action right around the start of the regular season, though it's not at all out of the question that he misses the first few weeks. Factor in the risk of re-injury or a limited impact on the basepaths, and Lindor has to slide down the rankings at least a little. He's arguably the riskiest first-round pick now. The Case For: You can count the number of players who stole 40 bases on one hand, and still have fingers left to throw up a "peace" sign. Turner's pace slowed down in 2018, but that was mostly a result of batting order: When he hit leadoff, Turner ran at a 60-attempts-per-150-games pace; in all other spots, he was at a 45-attempt pace. Turner was just the No. 28 hitter in 2018, but if he starts running again, he could be a top-five player. The Case Against: Given his speed and below-average strikeout rate, you'd think Turner would manage better than the .271 average he sported in 2018. Turner probably dealt with a bit of bad luck last season, but his swing profile doesn't really lend itself to ultra-high BABIPs, thanks to a low line-drive rate. Add in that Bryce Harper's potential departure might even move Turner down in the lineup, where steal opportunities will be more difficult to come by, and I'm not sure Turner will be better than Whit Merrifield, who should be available at least two rounds later. The Case For: Circumstances have conspired against him, but it wasn't that long ago that Harper was the best hitter in baseball. 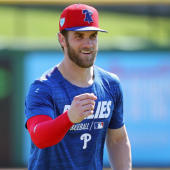 A mysterious upper body injury kept Harper from reaching those highs in 2015, and he was nearly as good as that 2014 season in 2016 but was limited to 111 games because of injury. Harper was probably better than he appeared in 2018, too; he had just a .289 BABIP, compared to a .318 career mark, and unlike Turner, he doesn't have a low line-drive rate to blame. Few players hit the ball as consistently hard as Harper, and better days should be in his future. Especially in a park and lineup as good as Philadelphia's. The Case Against: Of course, it's not quite so simple to just declare Harper a victim of bad luck. He's missed at least 40 games in three of his seven seasons after all, and his low BABIP from 2018 might not just be bad luck. His strikeout rate spiked to 24.3 percent, and the increased prevalence of shifting around the league means he could be losing a dozen or so hits per year. That's enough to lop off about 20 points of batting average right there.